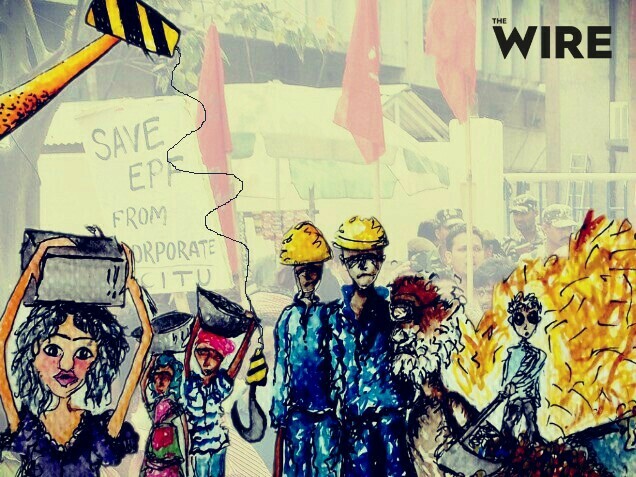 Earlier this year, the town of Thoothukudi in Tamil Nadu saw massive protests as workers took to the streets agitating against Sterlite, a company owned by the giant Vedanta corporation. The huge public action saw massive police turnout which ended violently with the police firing into the crowd. It is clear that the police shot to kill. They were not using “minimum force”. They killed randomly and psychopathically in an attempt to get the protestors to flee. While the shootings are being investigated, there is little hope for any kind of justice soon. The family of a contract worker has alleged that his employers burnt him alive for demanding his wage dues. This incident happened in Meerut, where Arshad, a contract construction worker, was working on a government school construction site as a caretaker and stocktaker. He had complained many times to this family about his employers not paying his wage dues. He had been in their service for over four years. While the employers claim that he left before Diwali, eyewitness accounts mention that he was working with them until the day – when he was seen engulfed in flames. His brother claims that in his last words he asked them not to spare his murderers. The family maintains that the police is refusing to file an FIR, yet the hospital is refusing to release the body of Arshad without an FIR. Over 10 lakh bank employees of 21 public sector banks went on a day-long strike against the planned merger of Vijaya Bank and Dena Bank with Bank of Baroda. The workers belong to 9 different employees and officers unions, under the banner of United Forum of Bank Unions (UFBU). Their contention is that such mergers would lead to reduction of bank branches especially in rural areas, reduction in staff serving these regions, a further curtailment on ATMs and also reduction of loans to small business and low income households. They back these claims with statistics from the recent merger of various banks with State Bank of India. While the central government has declared a policy to merge Public Sector Banks, the unions also contend that such mergers are a way to tide over the burgeoning crisis of bad debt, by making banks look stronger in their books. But in the long-term, large banks tend to be even more dangerous to financial stability as seen in US. They demand that the government spend its efforts recovering corporate bad loans rather than reduce the space for public sector banks while allowing free rein for private banks. The banking strike and unions claim, were a major success, with cheque clearings and other over-the-desk transactions being severely impacted. The unions have also planned to participate in the two day general strike on 8th and 9th January. GPS watches to track sanitation workers: How smart is this? One of the pet projects of the NDA government has been the Smart Cities. With everything wired into the digital space, smart cities are supposed to ease urban life and vastly improve civic services. As part of this project, many municipal corporations are planning or implementing, body-worn devices to track conservancy workers in real time. The irony is that while conservancy workers in many cities in India are fighting for better equipment – from brooms to collection bins and transport vehicles – the government seem to feel investments in GPS watches is a better way to solve the waste management crisis. While the government and research institutes have failed to develop viable technological solution for the scourge of manual scavenging, our governments are gearing-up to monitor and track workers with the latest technology. Improving the basic physical infrastructure, lessening the burden of garbage collectors and improving their motivation by offering them living wages are not the priority. How smart is this? Conservancy workers from across Tamil Nadu joined a protest against the privatisation of municipal solid waste management and demanded increased wages for their labour. The Chennai Corporation has decided to privatise solid waste management in 11 of 15 zones, up from 4 previously. There is also a possibility that such measures will be taken up in other local bodies. The workers are opposing this move as they feel private contractors will not offer them adequate wage or work security. Sailors on transnational marine operations face grave risk from employers as they’re often caught in legal limbo. 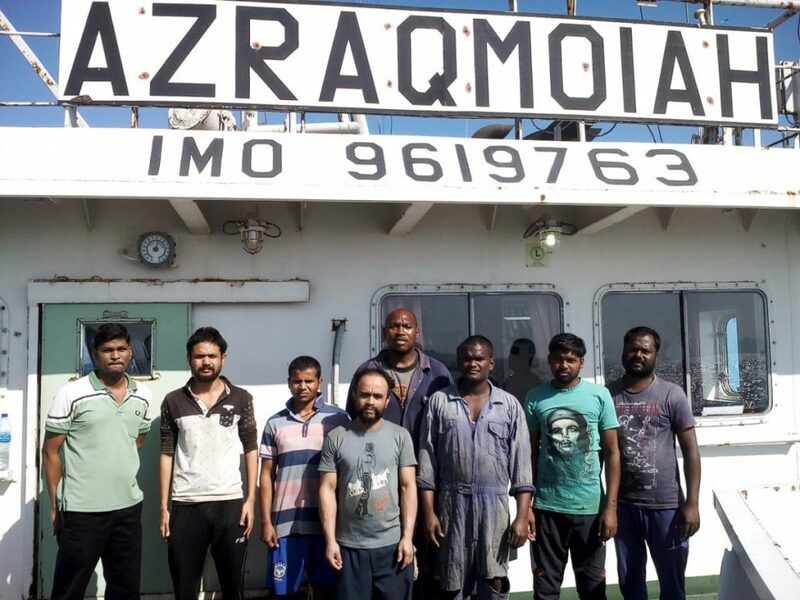 The Wire documented two recent instances in which Indian sailors were abandoned by their employers on foreign shores, after failing to pay their wages for months on end. The companies also take away their travel documents, leaving them vulnerable to detention and penalties. Even while there are NGOs that take up their case and certain institutional mechanisms in place with the ILO and International Transport Workers’ Federation, the various state agencies tend to be very slow in reacting to the plights of the workers. Crew members of the M.V. Azraqmoiah. This also exposes the workers to threats and blackmail by the owners to forfeit their dues. The article points to the need to improve regulatory mechanisms in India to prevent Indians from forced labour and arbitrary punishments overseas. Will it be a bleak New Year for Bihar’s public health defenders? They’re the needle’s tip of the rural public healthcare system, taking on multiple roles in the process of delivering medical support to isolated regions. Yet, their woes with regards to their work have often been overlooked or deceptively unaddressed. After prolonged struggles across various states, ASHA (Accredited Social Health Activists) workers were given a modest hike in pay (honorarium) by the Central government in September this year. But they are demanding recognition as government workers and a minimum wage of Rs 18,000. 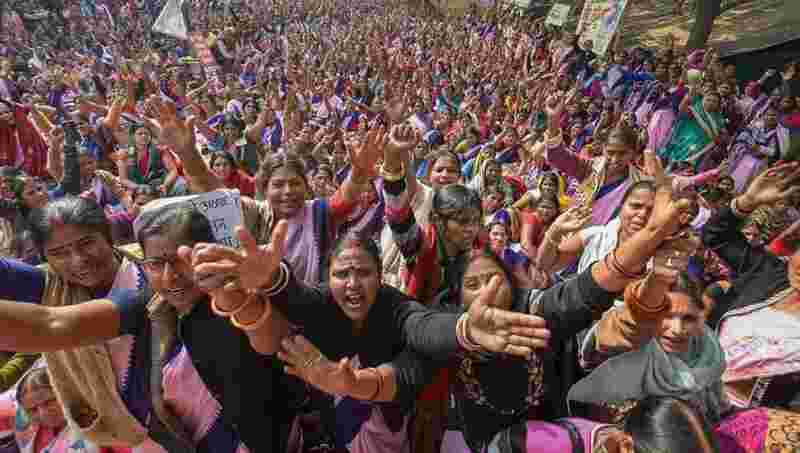 Bihar’s ASHA workers have been on strike since December 1, however the government has failed to engage with them or acknowledge their valid demands. Will the New Year bring them hope? Even as the death toll due to manual scavenging keeps reaching new peaks, our governments have been unable to undertake a complete enumeration of manual scavengers. In 2017, following intense efforts from organisations such as Safai Karamchari Andolan, a survey was commissioned to survey the number of manual scavengers for their eventual rehabilitation. The definition was narrow in scope covering only those clean dry latrines in the 170 identified districts. The manual scavengers were asked to self identify with committees set up by the state governments. About 55,000 self reported amidst claims of severe under-reporting. This led to the NITI Aayog asking the states to reverify the numbers. The states have come back with much lower numbers claiming many in the list had falsely identified scavengers. Harayana, Bihar and Telangana, have claimed they have none even though hundreds had self identified in these states. Many other states have reduced the numbers drastically. This has reopened the numbers debate, without offering any resolution in the near future. Time might be running out for the 15 miners trapped inside a ‘rat hole’ mine in Meghalaya for the past 15 days. The National Disaster Response Force and State Disaster Response Force having been trying to pump the water out of the 300-feet mine shaft before attempting rescue. However, they claim that the water level has remained constant at 70 feet. They are seeking more powerful pumps which have not yet been provided yet by the state government. The officer leading the team, has said that they noticed a foul odour in the water, which might indicate decomposing bodies – a very negative sign. However, the efforts continue in full swing. Rat hole mines, which are highly susceptible to cave-ins and flooding, have been banned by National Green Tribunal. 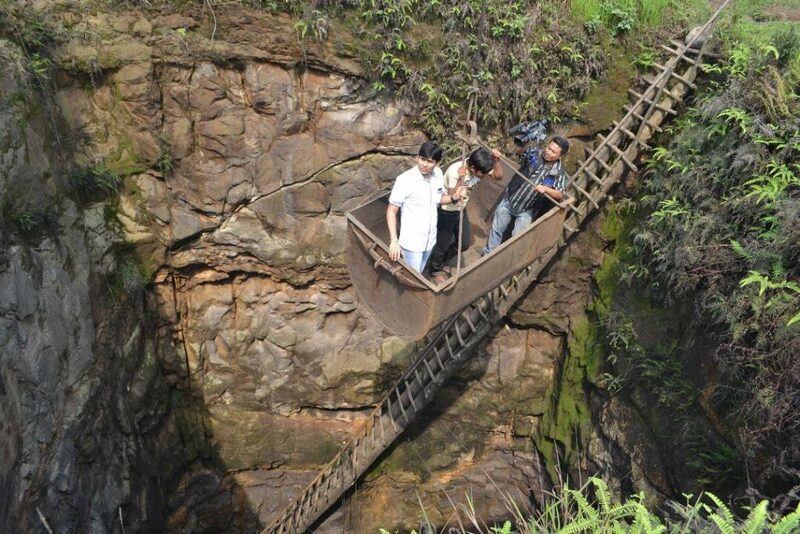 But it remains a rampant practice in Meghalaya for coal mining. 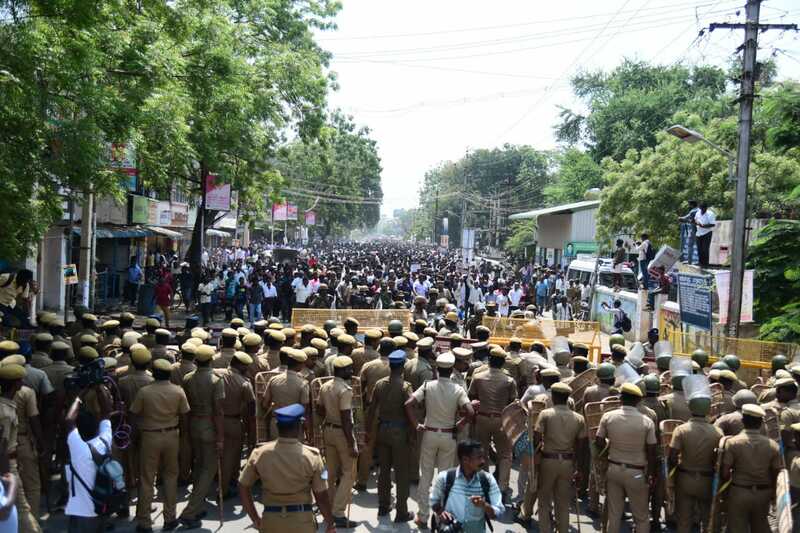 More than 300 workers affiliated with the Kovai Mavatta Pricol Thozhilalargal Ottrumai Sangam (KMPTOS) were transferred by the company after striking for 100 days over workplace benefits. The labour department convened a meeting with the management, the union and the collector. Finally, the collector asked the management to revoke the transfers and asked the union to call-off their proposed strike. In the tea plantations of West Bengal, the negotiations between unions and plantation managers came to a halt as owners refused to increase their minimum wages. The workers are asking for a ratio of minimum wage to food (called a consumption unit) that was proposed by the government in 1952. They want a minimum wage that will let them feed three people. The management says the wage should be only enough to feed one and a half people. “The reason we want the consumption unit to not be more than 1.5 is that unlike all other industries, in tea plantations, more than one adult [member of a family] works at the tea garden. At the very least, the husband and wife in each household are both employed,’’ said Prabir Bhattacharya, Secretary-General, Tea Association of India to Indian Express. According to the Los Angeles Homeless Services Authority, more than 15,000 people are now living out of their cars in Los Angeles. As rents get higher with wages not rising to match, many people working in Hollywood, including actors, assistants and technical craftspeople have been forced to live out of their vehicles. It’s been half a century since Keezhvenmani, a small village tucked in the rice bowl of South India, witnessed one of the worst massacres of Dalit agricultural labourers. In a gruesome climax to an ongoing class struggle between the labourers and the landlords, 44 dalit labourers were forced into a hut and burnt alive. The event and its denouement in court left a deep scar in the socio-political and judicial fabric of this country. Yet, these events have become emblematic of this nations inability to transcend its caste injustice and feudal inequalities. The article in Newclick, describing the details of the event, also discusses numerous other instances of systemic violence that have marked the political and social history of independent India since Keezhvenmani. Keezhvenmani, though, has had a profound impact on the cultural discourse in Tamil Nadu – spawning many works of literature and art – that portray the caste and class tensions of the times, while also invoking a desire to overcome such injustices. Here is an article in The Wire that chronicles some of these celebrated works. Memorials have been raised for the martyrs, claims and counter-claims have been made on their sacrifice, yet we as a nation seem to be trapped in antediluvian times, tolerating the perpetuation of similar crimes and without learning the lessons of history. Writers like Laurie Penny, Ken Liu and Nisi Shawl write about the future of work in a special fiction issue of Wired. Read all the stories here.